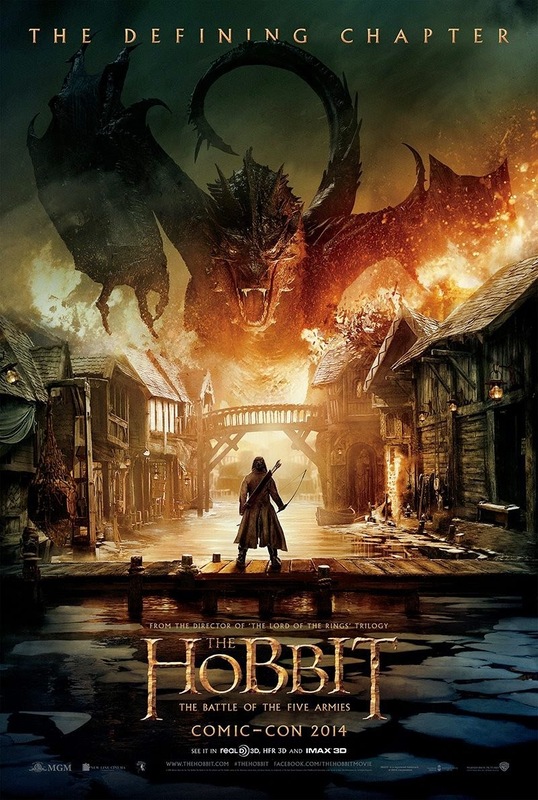 After part two of Peter Jackson’s Hobbit trilogy, The Desolation of Smaug (2013), I purposely dodged part three, The Battle of the Five Armies, when it hit the theaters earlier this year. My ennui with the series was akin to the hysterical 1969 Bored of the Rings parody penned by National Lampoon founders Henry Beard and Doug Kenney. I wasn’t bored at all by Jackson’s Lord of the Rings films, but it seemed to me that Jackson had said all he needed to in those three majestic films and that The Hobbit felt like Lord of the Rings Lite. Lord of the Rings made $3 billion on a $280 million investment, so I understand the allure of making The Hobbit, but my skeptical hackles rose when the project mushroomed from a one-off, to two films, and then a trilogy. A trilogy? J.R.R. Tolkien’s namesake book was just 320-pages-long. One can literally read it in a shorter period than it takes to view the three films (nearly eight hours worth). My skepticism was well placed; if The Hobbit were an undergraduate film, it would have been marked down for “padding.” I felt this keenly after The Desolation of Smaug, so I stayed away from the cinema in hope that more time would allow me to enjoy The Battle of the Five Armies with a fresh set of eyes. It didn’t work. Martin Freeman is delightful as Bilbo; Richard Armitage is convincing as Thorin, the dwarf king slowly driven mad by greed and dragon sickness; and Ian McKellen, perhaps to his chagrin, was born to play the wizard Gandalf. Performances are uniformly great throughout, including Benedict Cumberbatch’s voiceovers for both Smaug and Sauron. Still, The Hobbit was a children’s book and only four things of note happen in it: the formation of the dwarf/hobbit alliance, Bilbo’s escape from the Mirkwood spiders, Bard the Bow-man’s takedown of Smaug, and the final man/elf/dwarf/wizard clash with the nasties (orcs, wargs, goblins, trolls). In other words, the story could have been told in one film without resorting to tack-on slapstick sequences, giving big roles to minor book characters (Radagast, Alfrid, Kili), and inventing new characters to introduce an elf/dwarf romance (the elfin Tauriel played by Evangeline Lilly. Jackson even inserted Galadriel (Cate Blanchett) into part three, though she’s not mentioned in the novel. The problem with The Battle of the Five Armies is simple: once Smaug is felled about 20 minutes into the film, the next 90 minutes are just filler to get us to the culminating battle. I wish I could say the wait was worth it, but it wasn’t. What was spectacular in the Lord of the Rings series is now old hat. Jackson got us to suspend disbelief within those glorious battle sequences, but when obvious padding occurs in The Hobbit we start to ask questions about how a small intrepid band manages to slaughter thousands of orcs, why an orc chieftain can be killed with a single sword swipe on the street but can endure blow after blow and a near drowning in hand-to-hand combat, how you can “kill” ghosts with a sword, etc. In several scenes we watch orcs being mowed down, tumbling as if they were stalks of grain falling before a mechanical reaper. After one mind-numbing scene after another of this, the forces of evil begin to seem more like forces of ineptitude. I suppose this gives thrills in the ways progressing through a video game can satisfy, but at some point the vicarious sensations wear off and we wonder why we are spectators in this video game.